The Emotion Code is an energy healing modality that facilitates the identification and release of trapped emotions - the emotional baggage that we have created and that we carry. This is a heavy burden that we often don't even realize that we are carrying but which can limit us from fully experiencing life. So what exactly are Trapped Emotions? We are made of energy and emotions are energy as well. Our emotions are what shape our life and give it color and meaning. But with all of the positive emotions, like joy and love, also come negative ones. Sorrow, anger, grief, fear and feelings of depression or hopelessness are just some of the negative emotions that are also part of our life experience. What we may not realize is that some of the negative emotions that we experienced in the past, maybe even as children, may still be part of us. If you remember an unpleasant experience from when you were a child, the emotions from that experience can come right back into your consciousness and you feel just like you did when you had that experience, so long ago. And if you have a similar experience in the present, you may react in a way that seems out of proportion to the situation and you wonder why you reacted that way. That is because the emotional energy is compounding. You are adding more and more of that same emotion. And like continuing to poke at a wound that can't heal, your emotional reaction is compounded as well. It is what Eckhart Tolle refers to as "the pain body" in his book, A New Earth. The negative emotions, which carry a much denser and lower vibration, seem to be the ones that reside within us most powerfully because they are the emotions that we don’t want to feel. So we resist them instead of processing them and letting them go. And it takes a lot of energy to resist something. So we are giving those negative emotions a lot of our energy, which makes them stronger and more able to become trapped and reside within us. These negative trapped emotions that haven’t been completely processed and released consist of well-defined energies that have a shape and form. They become the “emotional baggage” that is more literal than we can imagine. Much of our suffering is due to these negative emotional energies that have become “trapped” within us. Because they are energy, they are as real as we are. They are not visible, but they are very real. Just as you cannot see the wind, but you can feel it, you cannot see a trapped emotion but you will feel its effects. And if you have a trapped emotion, you will attract more of that emotion into your life, and tend to feel that emotion more readily and more often. Like attracts like. Trapped emotional energy will always lodge somewhere in the physical body and the body tissues will actually tend to fall into resonance with the low vibrational energy of the trapped emotion. So there is a part of you that is always in resonance with that negative emotion. In other words, if you have a trapped emotion of anger, then there is a part of you that is always angry. You may not identify a part of you as angry, but you may have physical or emotional issues that are a result of that energy. Trapped emotions block and restrict the flow of vital force energy to the human energy field, what the Hindus call Prana and the Chinese call Chi. The body has the powerful ability to heal itself when it is energetically in balance and the life force energy is flowing. The Emotion Code is a simple way to bring the human energy field back to a more balanced state by releasing the blockages caused by the trapped emotions and allowing the vital force energy to flow. "Trapped Emotions can affect you physically just as much as they can mentally and emotionally. It is my experience that a significant percentage of physical illness, emotional difficulty and self-sabotage are actually caused by these unseen energies." ~Dr. Bradley Nelson - "The Emotion Code"
When a garden hose that has water flowing through it becomes kinked, the water flow is greatly restricted or blocked entirely. 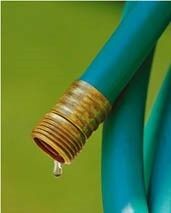 When we "un-kink" the hose, then the water can again flow freely. The Emotion Code can help you to find and release the trapped emotions that are exerting a powerful influence on you so you can reclaim your life, enjoy better health and find that sense of well-being that has eluded you. How do we release the trapped emotions? We are all connected energetically. So I can connect with you energetically, if you are sitting next to me or on the other side of the planet. It doesn’t matter. Our subconscious retains so much more information than our conscious mind. All of the experiences, thoughts and emotions of our lives are retained by the subconscious, even if the conscious mind doesn’t retain those experiences. So I can connect with you and ask your subconscious if there is a trapped emotion that can be released. If the answer is “Yes”, then I can find out what that trapped emotion is. Once there is an awareness – once it has been brought to the level of the conscious mind – then it can be released. We all generate an electromagnetic field. And so a powerful way to balance the energetic field of the body is to use a powerful energy tool. A magnet is such a tool. We can use a magnet, with the power of our thoughts and intentions, to clear from our energy system the blockages (trapped emotions) that we have brought to conscious awareness. Within our human energy field are small rivers of energy that flow under the skin, known as acupoints and meridians in the practice of acupuncture. Certain meridians are actually thought to function as reservoirs of energy, which connect with and supply all other acupuncture meridians. The most important of these is the Governing Meridian which begins in the center of the upper lip, runs up and over the head, and all the way down the center of the spine, ending at the tailbone. Because of the interconnections between the Governing Meridian and all other meridians, it provides the most ideal pathway for what we want to do as we treat the body for trapped emotions using the Emotion Code. A trapped emotion is energy. To get rid of a trapped emotion, we need to overcome it with another form of energy. The Governing Meridian provides the perfect window into the body for this purpose. A magnet actually magnifies thoughts and intentions, which are energy. So while holding the powerful intention to release the trapped emotion that has been brought to conscious awareness, a magnet is passed over the Governing Meridian. This magnified intention to release the trapped emotion enters into the Governing Meridian and from there this thought-energy-intention flows quickly into all the other meridians and areas of the body. This sudden influx of intention energy has the effect of releasing the trapped emotion permanently. If we are having an in-person session, then I will run the magnet over your Governing Meridian. And because we are all connected energetically, this healing modality can also work at a distance. So if we are working together over the phone or via Skype, I can release your trapped emotions by energetically connecting to you and then running the magnet over my Governing Meridian as a proxy for you. Yes, The Emotion Code can be used on animals as well! Their subconscious can communicate energetically just as a human's can. And animals can also have trapped emotions that are affecting them physically, mentally and emotionally. I can work with an animal and can provide the same energy clearing and release using The Emotion Code. Animals are often more open to releasing their "emotional baggage" than people, and the results of a clearing session can be quite immediate and profound. If you are interested in learning how to use The Emotion Code for you own healing, I recommend the free starter kit that you can receive from Discover Healing by clicking on the button below. To receive a FREE starter kit for learning The Emotion Code for yourself click here!